I had walked away from Miss. Eliza for about 37 seconds to go down the hallway and grab my phone. Coffee grounds. Coffee grounds everywhere. That sweet little babe of mine then attempted to help clean up all the grounds with water and paper towel which only made the mess worse. Oh and don't ask me what happened to the stool within those 37 seconds? She didn't fall. Honestly, I have no idea what happened here. How dare I walk forty feet in the opposite direction?! Never a dull moment over here, people, never a dull moment. ...Aaaaaaaaaand look at my face. I don't even know what to call this face. But the fact that I decided to take a selfie in the midst of The Great Coffee Grounds Spill of 2017 probably makes me somewhat of a millennial. Anyhoo, thank goodness for the shop-vac AND a sense of humor. Henry is loving school (knock on wood) and has been "clipping up" quite frequently. Once he clips up to rainbow he's allowed to pick out a prize. He's been loving these little animals and he's been sleeping with them every night. We're so proud of this little guy. We took the kiddos out for some frozen yogurt! I'm soooo happy we FINALLY have a frozen yogurt shop in town. Eliza decided to do my hair while we watched some college football a couple of Saturdays ago. There were also snacks, hence all the wrappers and bowls. 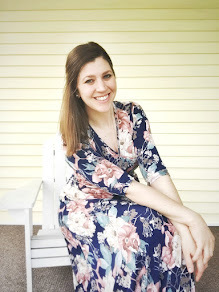 Oh and that baby seat over there is still out from a few weeks ago when I hosted a playdate. One of my friends has a little baby so I brought it out of the crawlspace for her baby to use. It's one of the "baby things" I couldn't sell as the music is crazy nostalgic and it brings me to tears remembering how my little Henry used to sit in it! I like to press the button just to listen to the music or Eliza will go over and press it. I love it so, soooo much. We visited a Hobby Lobby and I'm not going to lie, I was pumped to be seeing all their Christmas stuff out on display. ...and these decorative pom-poms - so sweet! We visited the coffee shop again. 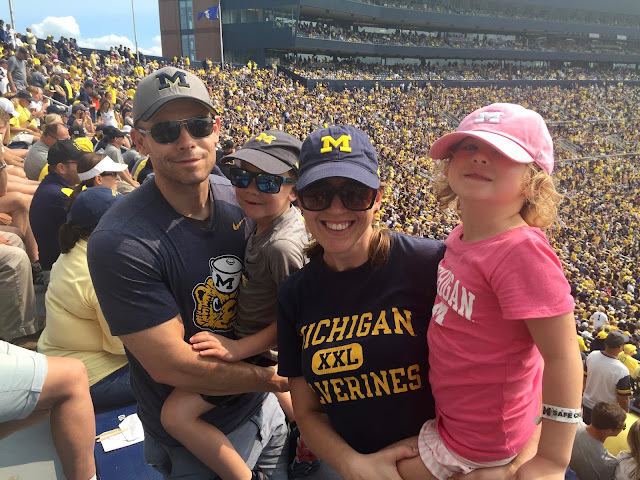 ...and then this past weekend, Jon and I took the kids to their first University of Michigan football game! Ummm...selfie?? I don't know?? I tried?? The weather has been gorgeous here in Michigan. We've had a few chilly days, but for the most part, it's been pretty pleasant. In fact, it was so warm for it being mid-September that it was kind of odd to see this tree (and other trees here and there) in full-fall-mode! The kids were ready to tailgate! I'd say that 50% of the time that Jon and I attend a Michigan game we tailgate on the golf course across the street from The Big House. 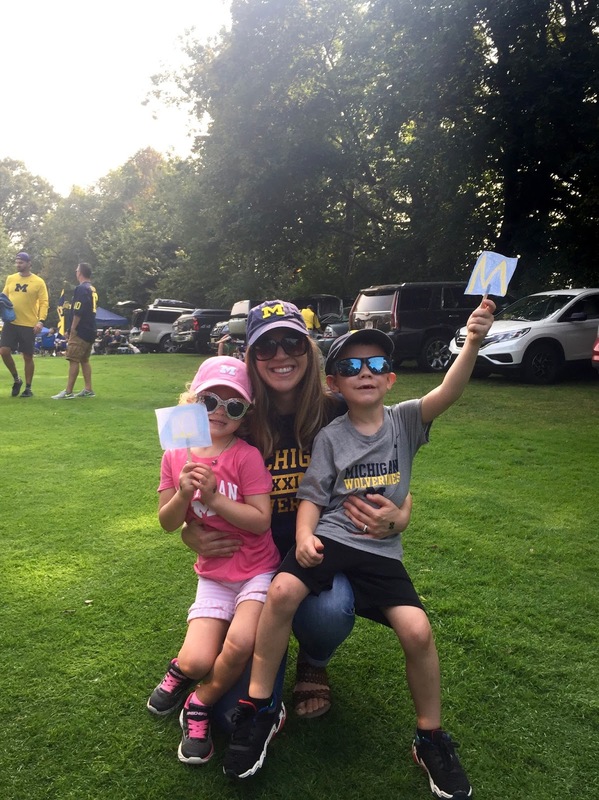 Although this time around our tailgating consisted of hanging out with our favorite little people, drinking juice boxes and eating cupcakes and doughnuts! We packed up and went and found the same friends who had just found us minutes before. Once over at their tailgating area, Henry and Eliza were offered doughnuts. The kids didn't decline their offer. The kids were all sugared up and it was time to head to the stadium. Right before we started to leave we saw these guys parachuting down into the stadium and onto the field. Unfortunately we weren't inside to see them land. Jon and I have watched them land on the field before, so I was a little bummed the kids didn't get to watch them come in! Darn it. We totally left too late. With two sets of little legs we were a bit slower getting over to the stadium than usual. I knew it, I just didn't plan for it. Oh man. Lesson learned. We also knew there was going to be an Air Force fly over. Sure enough as we were standing in line to get into the stadium four jets went right over heads. We definitely got to see it, but sitting in our seats and watching them come toward us and right over the stadium would've been way cooler and far more entertaining. Jon and I just figured that sitting amongst 111,000 people would be entertainment enough and we also knew it was going to to be different taking the kids for the first time than any other time we've ever gone alone. It was suggested to many parents as we were walking in to stop and get wristbands with our phone numbers on them for the kids in case they were to get lost. Believe me, I was not just holding the kids' hands I was squeezing their hands. They weren't going to leave my sight! I didn't find it likely that they'd get lost, but - hey, never say never. Safety first! As we were sweating and rushing over to our seats, I decided to chill for a second and take a picture with this little lady! We smiled through the sweat and were ready to go inside! You've seen me talk about how I never really drink pop here on the blog. I'm not going to lie, this was the best tasting pop I've had in years. I was so hot and thirsty - it really hit the spot!!!! Aunt Kimmy, here ya' go... LOL! There was a misting tent. Thank goodness for the misting tent. I told Jon that we did the whole tailgating and football game thing and the memory the kids will probably end up talking about most will end up being the misting tent. We were hydrated and misted. Time for the third quarter! Wouldn't ya' know it, a touchdown was scored right in our end zone. It was the first touchdown of the game and Henry and Eliza's first time witnessing a touchdown in The Big House! We came. We saw. We misted...again. We left the game a bit early to head over to a family reunion that was a little under an hour up the road. It was great to see and meet lots of family! That's my dad right there running with Henry and Henry's cousins! We celebrated my Great, Great Aunt's 95th birthday (and my kids' Great, Great, Great Aunt - crazy!). I had never met her, but I sang Happy Birthday along with everyone else anyway. Oh and I almost said the wrong name while singing...oops! LOL! On Sunday we slept in a bit and slowly woke up. It was another gorgeous day. Jon was down the lake for a few hours removing the ski course and I stayed back with the kids. The kids played outside here and there, I watched the boat traffic go by, I called my mom and we talked for a nice, long time and later, as the kids were outside playing again, I continued to read Anne of Green Gables. Bedtime came around rather quickly. Is it me, or do all kids at bedtime suddenly want to party/ask about where babies come from/want tell you about their entire lives since birth/ask you about your entire life since birth/question the origins of the universe/talk about Adam and Eve/want to finally read that book you've been trying to get them to read all day/tell 24 knock-knock jokes and/or have you tell them a silly story about a cantaloupe as a superhero?